Is your doggie a Jackie Russell? Your two pets are simply lovely. When my son was growing up, He had a bearded draggon named Boxcar. Boxcar was very wise. That videos so funny girl. Luv it when the dog hasd marching noises and when it cryes. big fan. your not on so much like b4. 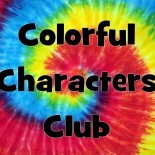 This entry was posted on February 12, 2014 by colorfulcharactersclub and tagged family, friends, fun, kid, kids, pets, teen, teens, Tween, tweens.